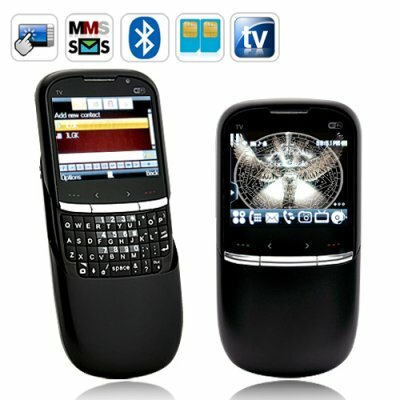 Successfully Added Black Magic - WiFi Slider Phone with QWERTY Keyboard and Metal Cover to your Shopping Cart. Introducing the Black Magic, a powerful Slider Phone that is the perfect combination of style, utility, and power. It comes included with a metal cover and sliding design that not only protects the handy QWERTY keyboard, but also all the amazing internal goodies like dual SIM functionality, WiFi, TV, and so much more! See the Magic: You'll be impressed at first sight (and touch) with the Black Magic Slider Phone and its beautiful black cover, which melds perfectly with the LCD touchscreen. Add on a sliding design and hidden QWERTY keyboard, however, and you have your first taste of magic from this phone. Just slide up when you need to send a few emails or text messages and when you're done, slide back down and the powerful metal cover will protect the keyboard (and phone) from any bumps and drops - easy and efficient! Feel the Magic: The Black Magic Slider Phone has something for everyone and is guaranteed to keep you satisfied. Want to freely surf the net and check out what's happening on Gizmodo? WiFi. Need to check out the latest breaking news that's live right now? TV and FM radio. Looking to just kill some time? Games, MP3 player, movie player. Worldwide Magic: The Black Magic Slider Phone operates seamlessly on the four standard global GSM frequencies (850MHz, 900MHz, 1800MHz, 1900MHz) so you can trust it to work anywhere in the world. It also has two SIM card slots, which is perfect for people who want to keep two active phone numbers inside one great phone! More importantly, the Black Magic was never locked so you can use it with any cell carrier or network you want. Only when you pick up the Black Magic Slider Phone can you truly appreciate its reliable weight and tough frame and realize that you have a top-of-the-line device in your hands. Available in our warehouse now, order today and we'll ship it out tomorrow. Brought to you by Chinavasion, the leader in wholesale electronics and mobile phones. Java apps include Facebook, MSN, Yahoo, Opera Mini, and many free games! Does Black Magic come with an analog TV tuner? Yes, watch TV and be happy with this quadband cell phone. What is Dual Standby and does the Black Magic have it? A phone which is designed to work with 2 Subscriber Identity Modules (SIMs) are called Dual SIM phones. Of these Dual SIM phones, the ones which allow both SIMs to be active at the same time so you can receive calls on both are called Dual Standby phones. Yes, the Black Magic is a dual SIM, dual standby phone. Great product and excellent quality. Fast delivery, only seven days via DHL to Brazil.